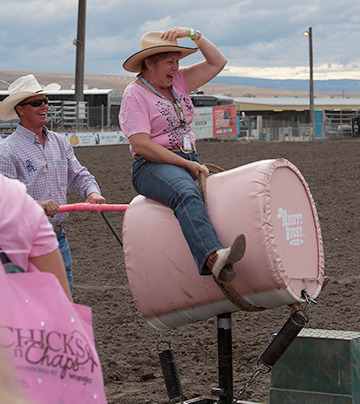 Chicks n’ Chaps, a rodeo event to fundraise for the fight against breast cancer, was held a week ago in Lewiston, Idaho, and oh boy (like oh BOYS in pink shirts!) 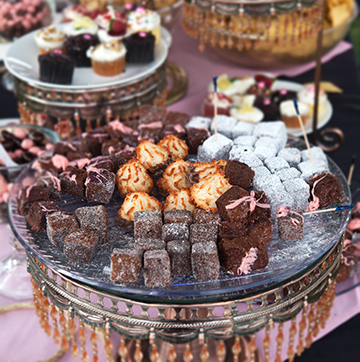 was it a fabulous event. 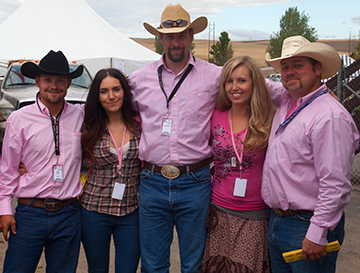 There was posing with the cowboy voluntees. 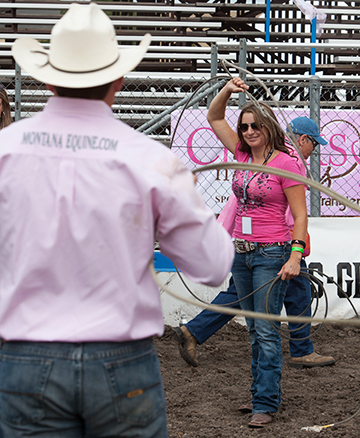 Many of whom were riding, roping, and bulldogging in the night’s events. Lots of great swag was given out. 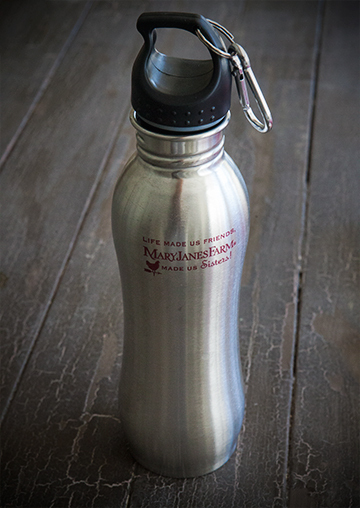 I sent along my MaryJanesFarm water bottles (with pink writing!) to be added to the list of great goodies. 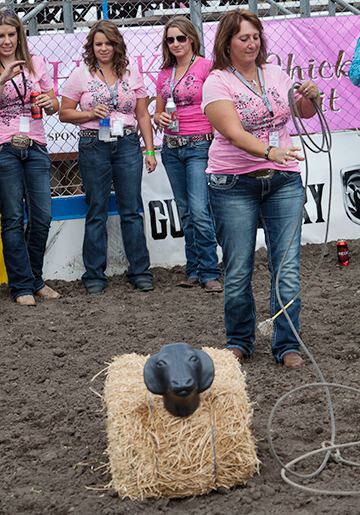 Don’t forget about the git-yer-boots-muddy events in the arena. 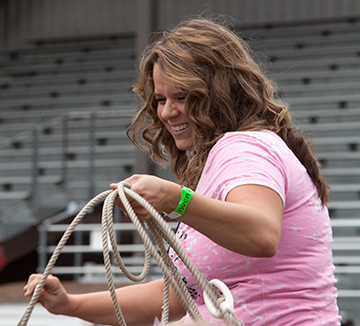 There was roping from the “high chair” (a barrel set up at about horse height on a couple of hay bales). 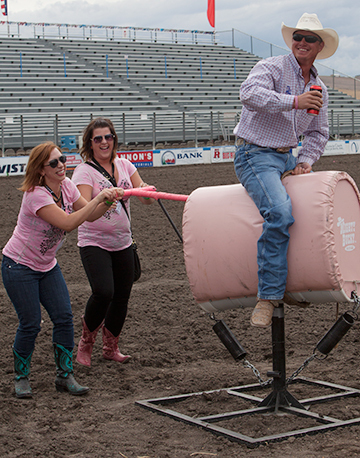 And a “buckin’ bronc,” manned by that fella with the smile. Each station had an experienced cowpoke to show ’em the ropes. I think they’ve got the idea! 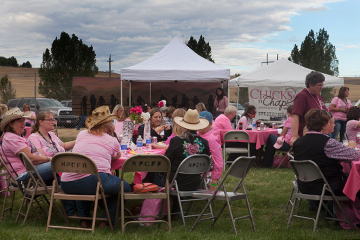 Once the dust had settled, the ladies made their way back for snacks and beverages, and to prepare themselves for the silent auction winners and live auction bidding. 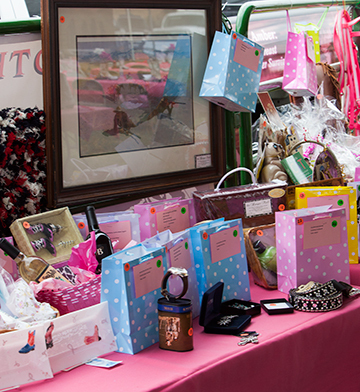 There was also a raffle table set up with donated items. 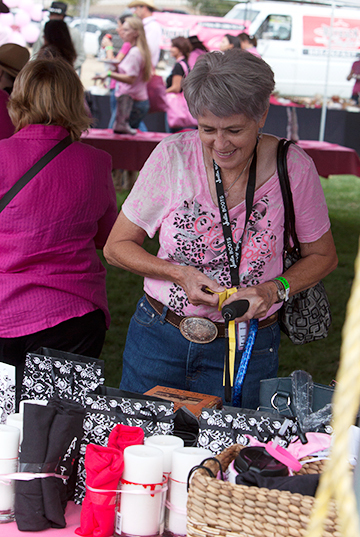 From chaps to a turquoise headstall, a cat-themed basket, a pink bridle, a painting, jewelery, purses, belts, gift certificates, handmade throws … the list went on and on. 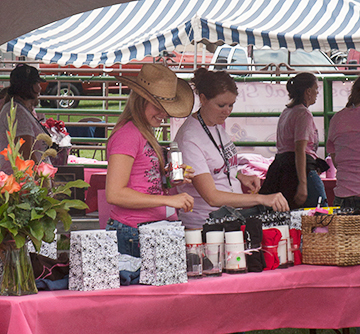 Lots of money was raised to support women in the fight against breast cancer. 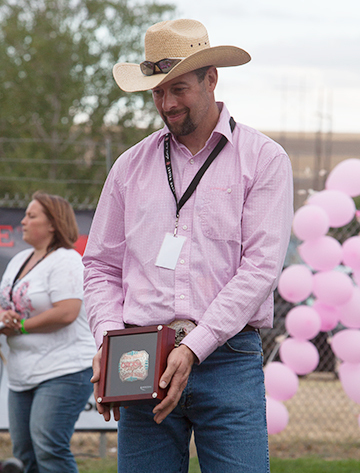 The live auction was also extremely successful; one cowboy’s shirt was auctioned (literally off his back) for $280! 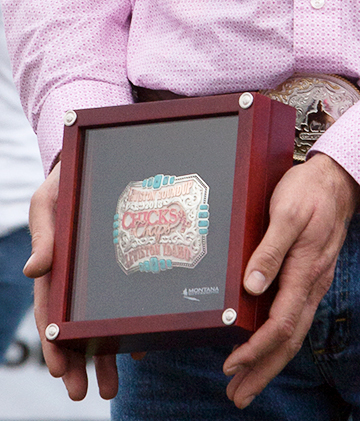 Among the many other items of interest was this one-of-a-kind Lewiston, Idaho, Roundup Chicks n’ Chaps belt buckle. 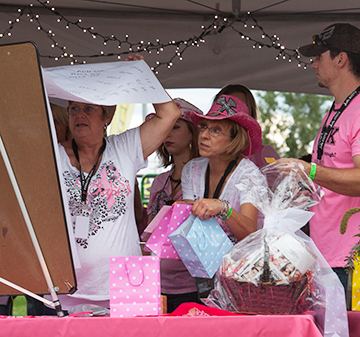 And here’s Gail Anderson helping choose the raffle winners. Gail was the one who let me know about the event so we could get involved. Thanks, Gail!! It was an honor to participate as a sponsor. 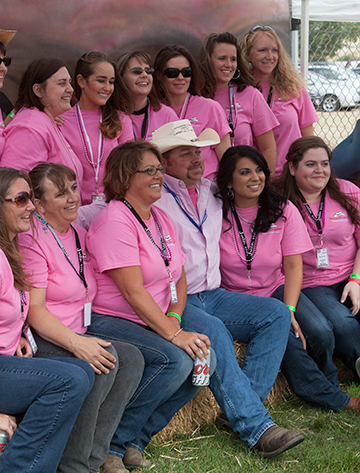 Chicks n’ Chaps have events all over the USA. Click here to go to their website and see how you can participate or start one up in one in your area. What a day!! 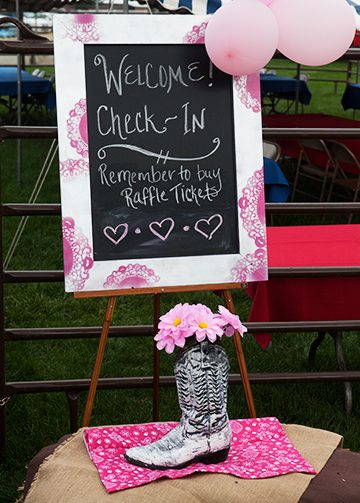 Fabulous charity event. 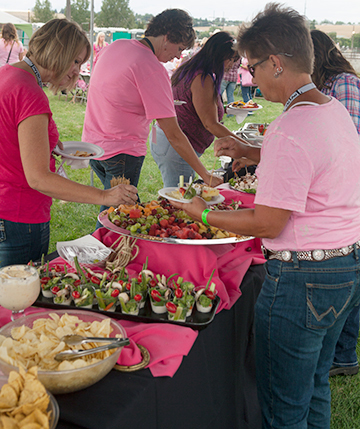 We always enjoy the Susan B. Kommen Breast Cancer day fund raiser on the Friday before the Preakness , the second race of the triple crown. 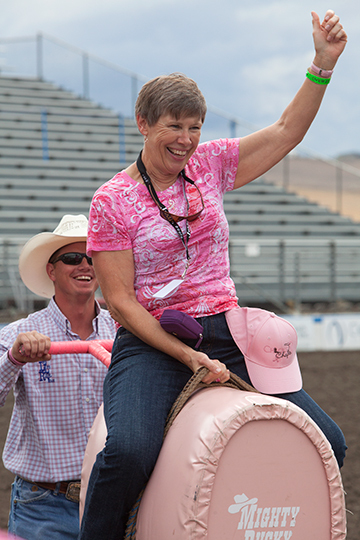 The race at the end of the day are just fillies and imagine sleek thoroughbreds with pink ribbons in their manes, pink racing colors where possible, pink leg wraps and escorted by mounts equally decked out in pink. When they fly by the first turn, it is a blur of brown,pink, and power! 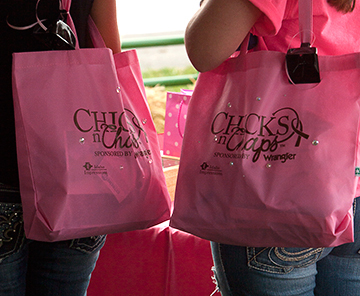 Breast cancer awareness and “fight” events are close to my heart and to my daughter’s. We have participated in many events of the past nine years. 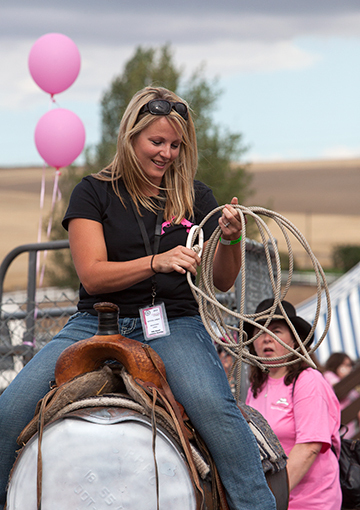 This sounds like a really great event . . fun and successful! Oh that would have been fun to attend!Thanks for sharing with all of us!